Do you want to L!VE a happy L!FE? TAYO Healing Centre (THC) was Founded in 1993. It was created by Tayo Irvine Hendrix in honour of Tayo’s beloved mother and first mentor in life. THC uses very bespoke methods of healing from shamanic practices, to metaphysical diagnosis all with the aim of helping the individual to heal at a soul level. Over the years Tayo has created many teachings all using the power of living in the moment of now. Whether using the, ‘NOW Breathe’, ‘NOW Thrive’ or ‘Experience NOW’ it is all about living in the moment and taking ownership for all that has happened on your journey to this moment. TAYO leads a ‘less ordinary’ life as a Shaman, Musician, Author, Storytelling Artist and Philanthropist, with a love of all things creative. Her mindful approach to each step of her teachings has come from her spiritual life experiences and many years of academic training. 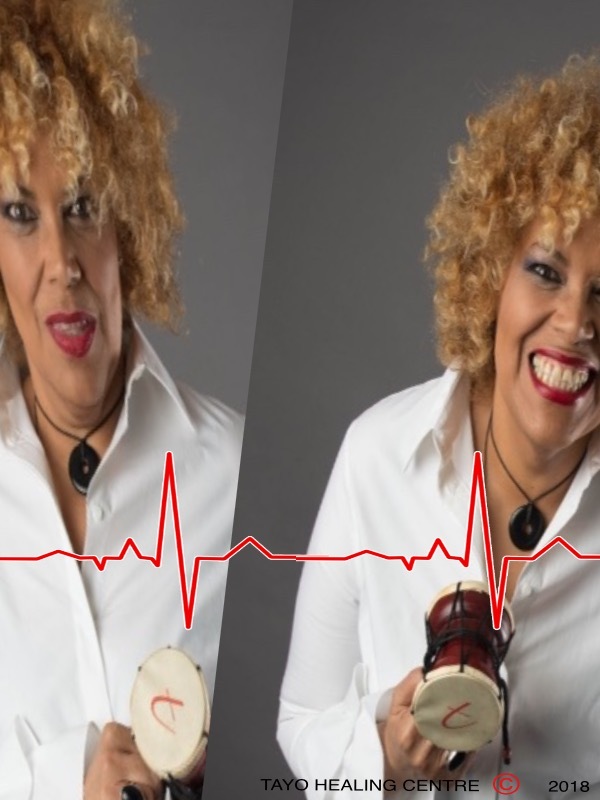 Her love of music and healing practices kicked in at just 3 years of age when she was given a shamanic drum by her father and taught how to connect that drum to her own heartbeat. Her own organic ‘algo-rhythm‘. This passion continued into her youth and guided by her parents, Tayo learnt to play various instruments from drums, guitar to vocals and studied her passion for shamanic drumming and healing. In 1988 after the suicide of a close friend and a near-death experience (NDE) for Tayo, her life took a very different path and she left music to concentrate on her healing and shamanic work. In her late teens, Tayo’s intuitive mother encouraged her to develop a myriad of healing disciplines. Tayo has a powerful shamanic connection with the life force in all of us. After the death of her beloved mother (1995), she re-entered education and qualified as a Psychotherapist, Counsellor and Hypnotherapist. Tayo’s core belief – the mind builds the physical result. Experience NOW teaches you the power of living in the moment of now. Whilst showing you how to dance to your own beat by connecting and discovering your own organic algorithm. You truly learn your inner beat. Why would you want to be like another when you can be this unique being. It is sometimes hard to hear your organic beat in this social media-mad world. A world full of white noise and sharp sounds. The Tayo Method teaches you the skills you will need and reminds you, that with the modern world beating down your door constantly, changing and evolving is a required skill. This course helps you to find your way, through the darkness and back into your own unique light. Experience NOW is a physical way to move energy blocks within your own algo-rhythm, get to the root of your problems and live a brave life. Too often, we are keen to look to the past to see what went wrong and look to the future to ‘hope’ for something different but if you live in the power of now then you can truly be the difference you want to see in your life today. Your life is determined the moment you are born, the question is, are you truly ready to live to your full potential and dance to your own rhythm. TAYO is a multifaceted individual who has learnt to accept and embrace all of her life experiences. She has put those along with her vast training, qualifications and knowledge, towards betterment and enrichment of other peoples’ lives. An acclaimed shaman, musician, author and storytelling artist, she is recognised for bridging the gap between ancient healing methods and modern culture. Her passion is to provide healing for the mind, body and spirit through metaphysical growth and knowledge. Her goal is to ensure that nobody feels so lost in this world they can not see their purpose. For 25 years Tayo has been developing a unique style of healing. The TAYO Method Programme works by treating clients from the roots by tapping into their authentic organic algorythm. Tayo believes this was her purpose in life. ‘A shaman does not choose to be a shaman. The path they walk is chosen long before they get there’. From childhood, Tayo was taught about spirit, elders and the spirit world and communicated without fear. TAYO connected with her own guides very early on. By the age of 5 she could see and talk with her guides. By late teens she was spirit writing and offering guidance to friends and family members using cards, black mirrors and astral travelling. It was in her early twenties whilst enjoying life as a carefree musician her world changed forever. Having always felt deeply loved by her family it was hard to understand how someone could feel so alone and disconnected that suicide was their only option. Tayo withdrew from the world of music to try to find the answer and understanding. After a long and dark, two years she joined a healing circle and began the journey home to inner love and the unique TAYO beat that takes life by the hand. TAYO is a member of BACP, UKCP, ICHM, IMP, PHPA, SAGB and NFSH. She is an experienced and qualified Spiritual Counsellor, Hypnotherapist, Psychotherapist and Past Life Therapist (Past Life Regression). Tayo has studied with Shamans and Scholars alike and is experienced in modern and ancient practices. Shamanic Drumming, Sacred Space Clearing, Emotional Freedom Technique, Crystal Healing, Reiki, Aura Cleansing and more. She is a Motivational Speaker and Mentor. 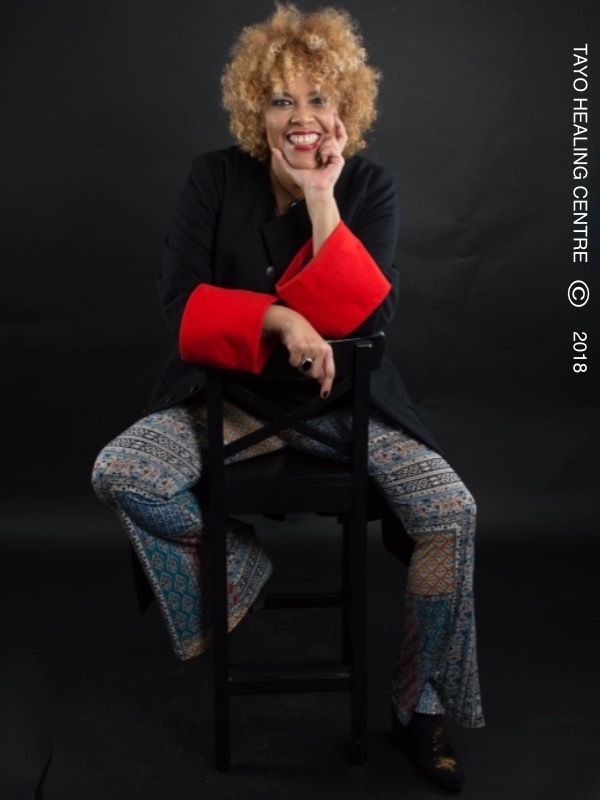 Having spent the last 25 years creating her own authentic and proven programmes ‘Tayo Healing Method’, encompasses them all from ‘Memory Recall’, ‘Reflective Healing’ and “Living Beat’. A ‘Shamanic Drummer’, and Dream Interpreter she takes everything that happens in your life and helps you to understand and appreciate your own authentic beat and soundtrack and L!VE BRAVE. She is currently studying Philosophy. The current waiting list for a one-to-one appointment is 5 weeks and she is often in demand for sacred space clearing and spirit clearings. Tayo has performed clearings at Ground Zero in New York, USA, the site of The Marchioness riverboat disaster in London UK, and the homes of Sir VC Bird Sr, the first Prime Minister of Antigua and Barbuda to name a few. She does, of course, do clearings for smaller locations which can also be done on-site. Tayo’s private practice in London, England offers healing and counselling to individuals from all lifestyles, encouraging them to live an excellent life NOW. She runs spiritual retreats at the exclusive St. James Club in Antigua and the USA. Whilst also running the ‘First Steps /NOW Thrive Programme’ in Europe. With so much empathy, understanding and the ability to look deeply into the soul of an individual, many people were drawn to Tayo as a healing light. Within two years she set up The ‘Tayo Healing Centre’. This programme encourages the individual to reconnect the disconnected soul and ultimately led to her studies into psychotherapy and counselling. She went on to study hypnosis and realised that so many people went back beyond the womb during that process that Past Life Recall was a necessary part of healing the current mind. Progressing further to add what Tayo called shamanic experiences to this form, she went on to create her own unique form of healing. After 3 years of clinical research now known as Memory Recall and Reflective Healing. The Tayo Healing Method was born. All aspects of Tayo’s works centre on discovering and connecting to your inner beat, bringing the magic of NOW back into your life. Tayo is the mother of two children (both adults now). She founded the TAYO Irvine Hendrix Youth Foundation (TAYouth) in London, England in 2009. 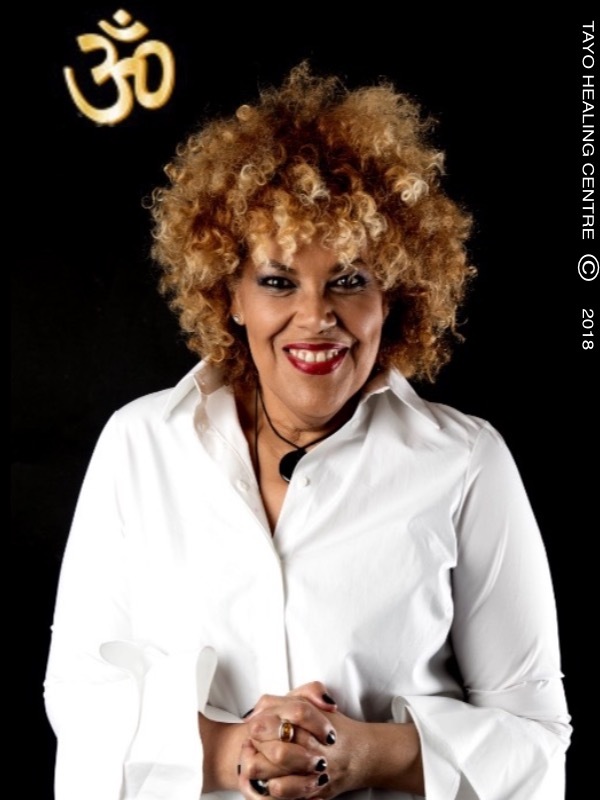 A passionate musician and artist, her latest music project encourages individuals to experience LOVE and she launched her last single ‘We Shall Overcome TODAY’ in 2017 (#WSOT). It was her version of the ‘We Shall Overcome’ activist track recorded by Bob Dylan in the 60’s. Tayo’s passion in life is Mental Health and helping individuals feel strong in their mind and body. ‘Nobody should feel so alone and disconnected in this world that they take their own life’. The Tayo Healing Centre, based on the Kent border of London, England provides esoteric healing, counselling, coaching and more. The primary aim is to provide emotional and physical healing from the very roots of the individual. Tayo has helped many clients from all walks of life; artists to athletes and CEOs to young persons. The Centre also facilitates patients suffering from physical conditions such as: cancer, paralysis, EDS (Ehlers Danlos Syndrome) and MS (Multiple Sclerosis). It came into being in 1997 and stands on the edge of an ancient woodland known as Lesness Woods, which itself overlooks the beautiful 12th century ruins of Lesness Abbey. These woods have the most amazing energy and Tayo can often be found working with clients in the seclusion of this wonderful environment. Tayo Method offers you the chance to take control of your life; to find ways to support your ‘self’ emotionally, physically and spiritually. This is a learning tool for you to use as often or as little as you wish, where you can connect with those who will inspire and encourage you to live your best life. 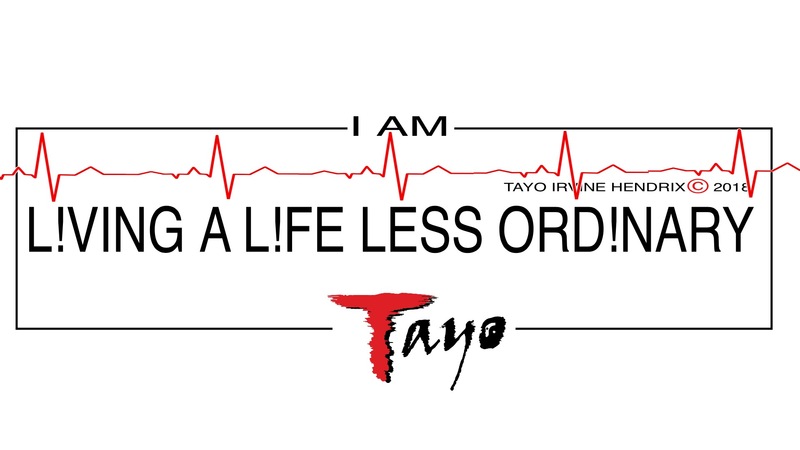 Tayo can help you determine your life’s purpose. Not only will you learn to live your best life, you will learn to recognise your true potential and gain inner peace from the roots up. Reflective healing is a practical holistic approach to optimising health through the power of your own reflection, and awareness encouraging self-empowerment through your own image. Using the power of mirror work, we recall from memory stored programming and situations that over a life time have caused you to limit yourself and hinder your own personal growth. This programme enables you to understand and embrace these experiences, allowing personal growth at the deep end. Cognitive mirror work is a totally personal approach to your life and connecting your inner authentic beat. Your memory stores negative experiences far quicker than positive ones and negativity is far heavier than positivity. When you are negative, you sink like a lead weight. When you are positive, you rise like the air bubble you are. Your reflection is a mirror to the world, of how you see self. Sometimes it can be the simple image you have issues with, you cannot love what you do not see as beautiful. But often the issue is, we are taught by parents, teachers, clergy, those who have power over some part of our youth, who often themselves have issues and lack self-love. When this happens this is projected onto the individuals they are dealing with. One can only every judge by their own yard stick and if they are in pain or do not know how to love themselves, they cannot teach us how to do something they do not know how to. Through this treatment you see the true inner beauty, becoming more beautiful than you had ever imagined possible. You learn to realise and remove this programming through memory recall. As children, we learn what we are taught. The teacher is more important than most people could ever realise. Thankfully, we are constantly learning but that choice is yours. This treatment revolves around purification of the mind and body. Using memory recall and relaxation techniques you are able to fully embrace life and harness the body’s own natural healing powers, discovering and connecting parts of the mind that have been misaligned through negative actions or words, bringing balance and harmony into your life once more, allowing you to confidently walk to the beat of your own drum! This shamanic form of self-hypnosis was created by TAYO in 1997. By relaxing the mind into a state of complete harmony with the whole body, TAYO is able to read every cell and see itself in its wholeness, surrounded by unconditional love, whilst being removed of all human indoctrination. You are then able (with Tayo’s help) to see the beauty at the very core of your being and recognise the roots of your soul, acknowledging the unique child within. For some this child has had a wonderful journey, full of love and knowledge. For others, (s)he has suffered. The child is you, and only you can set ‘the child’ free. Memory recall connects you to each internal cell, remembering the sensations attached, searching for moments of truth when you have been hurt by another’s actions or words. Tayo takes you back to the womb and beyond, where the only sensation was warmth and you wanted for nothing. It is from this space that we do our deepest healing and it is in this space that you remain for the duration of the session. In safety, with Tayo, you are able to re-view that action with the knowledge that you are a loved and cherished human-being allowing you to see that those actions were just actions of another human being in pain, though frightening to ‘the child within’, they do not have the power to hold you back in life any longer. Tayo shows you how to reconnect with your core soul and reminds you of your power to change your life, to be happy and fulfilled in the moment of NOW. The mind, especially the memory, is your most powerful tool. TAYO gives you the opportunity to decide whether you make it your ally or your enemy. Everything you need is within your grasp, you simply need to recall your unconditional love of self. You make the choice to L!VE BRAVE. TAYO is a shamanic practitioner, spiritual counsellor, energy specialist and medium, known for her exceptional skills in working with spiritual energy. A clairvoyant, clairaudient, clairsentient, channel and empath, she has a powerful connection with the spirit world and beyond. As a shaman, Tayo functions in a fertile, supportive, positive social context, her readings are revered as a reliable source of essential wholeness, energy and power. All with the desire to help you L!VE your best life. Tayo’s personal power is amplified by her guardian spirit ‘Niall’ along with a number of additional helpers and totem spirit animals. She walks with the black panther and carries gecko in her pocket. Tayo is recognised for bridging ancient healing methods and modern culture and has created her own powerful programme that really works for the individual. Shamanism and Mediumship are very different – a shaman is active whereas a medium is passive. Shamanism is a ‘visionary’ tradition, of ancient times, involving the practice of altering states of consciousness. Shamanic journeying is the art of travelling to the natural worlds beyond to retrieve knowledge that help an individual make positive changes in this life. Today we are more aware of the fragile ecological balance and we are therefore more in tune with the natural world and ready to learn. It is not surprising that more people are realising the strength within the knowledge held by the elders. Shamanism sends the clear message we must respect the sanctity of the natural world before it is too late. Shamanism involves Tayo going forth to actively seek something, and as the seeker she is fully aware of what she seeks and everything that is happening and has happened during the vision. She takes full responsibility for her actions. Where as in her role as a medium, she is receiving something from the divine spirit or force, working as a channel, passing on information given to her by spirit guides, Niall or Sam. Tayo is blessed to have both qualities. Shaman will often walk with spirit and she is privileged to walk with two such amazing spirits daily. EFT uses gentle acupressure to rapidly reduce pain and distress of any fixed emotional state correcting negative core beliefs, learnt behaviours and limitations. It relieves acute emotional distress and chronic problems like addictive urges, pain and depression often alleviating traumatic stress associated with the condition. Using EFT as part of the Tayo Method offers a multi-dimensional, psychological healing that bypasses the cognitive and treats problems at their source – the roots. So how does it work? Many acupuncture meridians come together and enter the brain at specific facial acupressure points close to the eyes, which are activated during the treatment as the client gently taps and accesses the stagnant energy or emotional disturbance through creative visualisation. The combination of activating the acupressure points and the individual attention permits the brain to process the information in a clear, concise way. The memory is recalled and looked at in an unemotional way and very quickly the blockage is removed and the energy begins to flow freely, allowing the individual to feel whole and complete once again. The emotional aspects of healing can be just as important as the physical. The mind builds the physical result. Positive thought leads to more positive action and with that, there is an excellent chance of a positive outcome. Attitudes and emotions have a direct bearing on the success or failure of the treatment process and this can be seen in medicines, hence the placebo effect. If you maintain a positive, happy and hopeful attitude to things, whilst keeping your mind open to all possibilities and allowing the universe to support you, then you are likely to be a lot more effective than if you are filled with doubt, fear or disbelief. Negative thoughts, along with negative attitudes and emotions (such as resentment and anger) build a resistance that is difficult to overcome. Positive thought leads to positive action and hopefully a positive outcome. Feel free to explore the different treatments and services in the Tayo Method below. To go straight to the booking details please click Here. From ancient practices in Africa, the Americas and Europe, music was composed and performed with healing intent. During that time in the ‘civilised’ west, music was largely removed as a healing tool and became purely aesthetic. In more ‘primitive’ cultures music has remained an important part of healing rituals. As a composer, healer and humanitarian Tayo is interested not only in music for entertainment value, but for it’s intrinsic healing powers above all else. Through voice, mantras, chanting, and drum we teach healing from the roots. We hope, as you share this journey with us, you will truly understand the power of music and what music can be when it is understood and applied by healer, therapist, composer and layman alike. African and North American cultures alike believe ‘medicine’ has a much broader term than it is given when used by modern medicinal practitioners. It is a beneficent force, the universal source of wellness, completeness, unity and truth. Emotional Therapy combines therapies that complement each other, brought together in this unique style by Tayo to deal with emotional traumas. One-to-one counselling, along with hypnosis and psychotherapy can achieve powerful results alone. However, Tayo takes these skills and incorporates reflective healing, emotional freedom therapy and memory recall delivering an incredibly powerful healing tool. Along with ‘homework’ [including music therapy, mantras, affirmations, exercises and journal work] this bespoke healing programme facilitates self-empowerment at the deepest level. This intensive programme of healing has taken Tayo over 20 years to perfect and is unique to Tayo Method. Everything that is holding you back is coming from within. Tayo can help you to re-programme your mind and L!VE your best L!FE. Have you walked into a room and just felt a chill, or uncomfortable, without reason? Or that feeling of being ‘watched’? Sometimes this is a spirit, who has remained ‘here’ after death. Often this is because they are worried about leaving their loved ones, they want to be close to people, places, animals, even inanimate objects. Or it can be a fear what awaits them if they move on, perhaps they are unaware they have even died or maybe they just cannot find the ‘light’ to let them leave. Imagine if a family member or friend was lost and despite their distress, no one tries to help them! This is someone trying to find their way home but have become lost on the way. With Niall’s help I try to guide them home safely. This was my role at Ground Zero – to help spirit prepare to leave their loved ones and move into the light and to help clear the energy that was left behind. Just like the ripples caused by a pebble on the lake, the ripple effects of Ground Zero will be felt for a long time but it will heal. Every clearing heals it a little more and Mother Earth knows that it will settle again in time. Many successful people, from sports personalities to top executives, enlist coaches or mentors. Coaching starts early for us all; children may be coached by parents or teachers, but as we grow older we lose that protection and the ability to ‘unburden’.Leaders, people in places of power and influential people don’t just have advisors because it looks good but because they value another persons perspective. Finding a good degree of objectivity can be hard when you’re in the thick of it and ‘going it alone’ can be isolating for anyone. Coaching can broaden your thinking and allow you to come to the best possible solution. What Tayo offers is a deeper insight into the best way forward on your journey. Tayo believes the individual creates the solution and the outcome. She shares with you via models, techniques, strategies and attitudes, the most effective way to achieve your goal. Her support is available through remote coaching if you are unable to attend the Healing Centre in person. Remote coaching is via telephone and additional email support. Tayo can train managers as coaches and set up in-house coaching and mentoring schemes. Services are all available as telephone and one-to-one sessions. To create such a service needs dedication and support and over time Tayo will be introducing like-minded individuals into her team who can either provide the right environment for such work in the form of ‘residential’ workshops or contribute to healing programmes with their knowledge and experience. If you wish to make a booking for any of the services offered at the Tayo Healing Centre then we suggest a preliminary session with Tayo. This will allow you to decide if Tayo is the right coach for you and the kind of service(s) you need from the Healing Centre to boost you in your day-to-day life. The majority of Tayo’s work does not require your presence in the immediate area and can be completed over the phone. However, she can do one-to-one appointments with you either at the Healing Centre, your own chosen location or other locations frequented by visitors to the Healing Centre. Sessions are slightly different according to your needs and also for one-to-one sessions, however, they will always be orientated to your goals and needs. Everyone is different so you will never receive the same advice as another person. Please contact the Tayo Healing Centre at +44 (0) 1322 413413 to arrange your first session to discuss your coaching and any other services you may be interested in.